Recent Birmingham City University graduate, Jodie Wingham challenges the boundaries of printmaking and traditional methods of display by disrupting her imagery’s flat surface with sculptural interventions. Two of her works, Sitting Cross-legged and Unbuttoned are being shown as part of New Art West Midlands 2018 at AirSpace Gallery until 31 March. 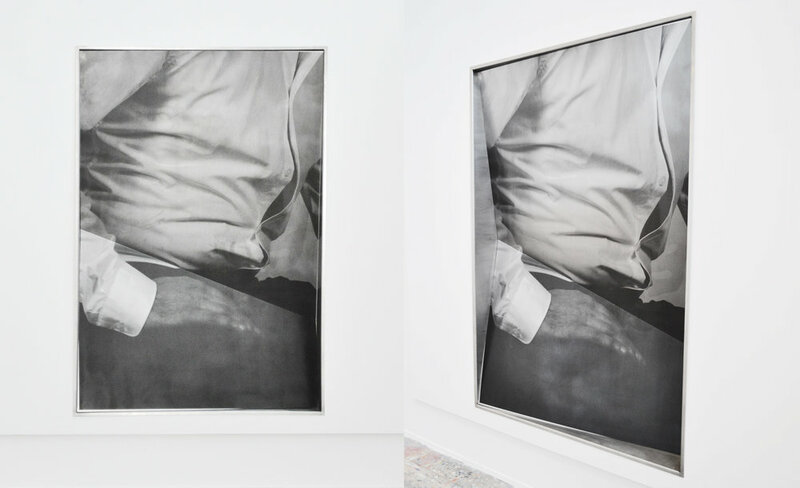 In her practice, Wingham encourages the voyeuristic tendencies that lurk within the human psyche by presenting the viewer with seductive images of scenarios that are usually hidden from public view – like the bare legs of a cross-legged woman or the undone button on a man’s shirt. Inspired by The Pictures Generation and the language of advertising, the artist ultimately seeks to heighten her audiences’ relationship with these hidden, private moments. Selina Oakes: Your work plays with notions of human curiosity and the cognitive pleasures experienced when something hidden is exposed. Why is the act of ‘revealing’ important to you? Jodie Wingham: This is based on a mixture of personal interest and research into psychological ideas on the nature of sight being an important driving force for our desires. As an individual, I’m drawn to the moments that you’re not meant to witness or pay attention to within the public sphere. You are allowed into a narrative which you have to embellish to make sense of: the act of revealing has not yet ended – it is not fully revealed – therefore it remains in this state of suspense, which I believe is far more interesting than the end result. The idea of what is about to happen, or what is being revealed, is often far more satisfying than what you may want to know or see. This is because your imagination has to work to fill in the gaps. It is this moment that exists ‘on the cusp’ that I like to play with and, because it doesn’t give everything away, you as a viewer have to be involved in the development of the image or idea. We as a society have information readily available: images are explicitly shown in media, billboards etc. We no longer think or take notice of the finer details – not really. I want to entice a longer gaze: one that the viewer, as an individual, fuels. SO: Sitting Cross-legged and Unbuttoned distort the aesthetic of high-end advertising and are reminiscent of works from The Pictures Generation. Can you discuss some of your art historical and cultural influences? JW: The Pictures Generation is an excellent reference as I was influenced by their usage of media techniques to produce their work. In my own practice, I am aware of the media’s influence on our interaction with images and the bombardment of information that we consume. My photographs may appear reminiscent of the images that we interact with in the media, however I don’t use models that fall into the industry’s ideals. My imagery is meant to represent real people: it’s an interplay between magazine aesthetics and non-typical models to disrupt what you expect. SO: You present a predominantly two-dimensional medium – printmaking – in an unconventional and sculptural way. What draws you to bend the traditional rules of display? JW: I became frustrated with the idea of printmaking being seen as a traditional and often boring art practice in the fact that the prints are often flat, displayed within frames and hung on walls. Print is so much more and can be pushed to the extremes like any other art practice. I wanted, and still want, to see what is achievable in print by using a cross-disciplinary approach to create alternative conversations of what print can be and how it can be displayed. My ideas focus around the viewer being involved in an image – an image that is usually voyeuristic in nature. For me, it is important to promote the interaction between image, display and audience: the use of sculptural elements introduces a physicality which the viewer can interact with. In doing this, it upsets the common reading of an image and, through the addition of different viewpoint and angles, the print takes longer to read. This prolonged gaze is an important theme in my work. SO: Does gender representation come into your practice, either through your choice of imagery or materials? JW: Even though I do not make work with set gender representation ideas in mind, it would be hard to say that gender representation is not present within my practice, particularly within this body of work. The image of a woman sitting crossed legged with flesh clearly on display naturally initiates a conversation on how women are represented and what the image is saying by using that particular pose. I was aware of this when creating Sitting Crossed Legged, but I didn’t want it to be the main idea that people thought of when looking at the piece. With this awareness, I chose a model who did not conform to set ideas of media shape and size – what people may deem as a ‘model’ woman. She is not digitally altered, and I wanted to only use the cropped section of the chair seat with no face: without an identity this woman could be anyone and allows a closer association with the ideas behind the piece rather than the sitter herself. Similarly, ideas around gender representation can be applied to the male sitter in Unbuttoned. Here, notions on how masculinity is portrayed in the media arise, but I try to focus the scene on the opening of the shirt. I am aware that the imagery in my practice (and possibly the materials used, for example, metal is commonly seen as a masculine material) engage with notions of gender representation: I’m currently thinking about whether this is an important conversation to include and play with, or not. SO: As a visual arts graduate, how do you intend to continue with your practice? Have New Art West Midlands 2018 and the show at AirSpace Gallery bolstered your confidence for future projects? JW: The visual image will always feature in my practice. I want to see how far I can push the boundaries of the printed image by working on new ways to make the discipline interactive for the viewer. Traditional printmaking is a medium that I love to work with, however, it is often displayed in a set way. I believe this should be challenged and the art-form represented more often in contemporary art practices. That being said, intimacy has become a much more prevalent concept for me. This is not so distant from my previous work, as I have always wanted the viewer to have a more intimate connection with the images. 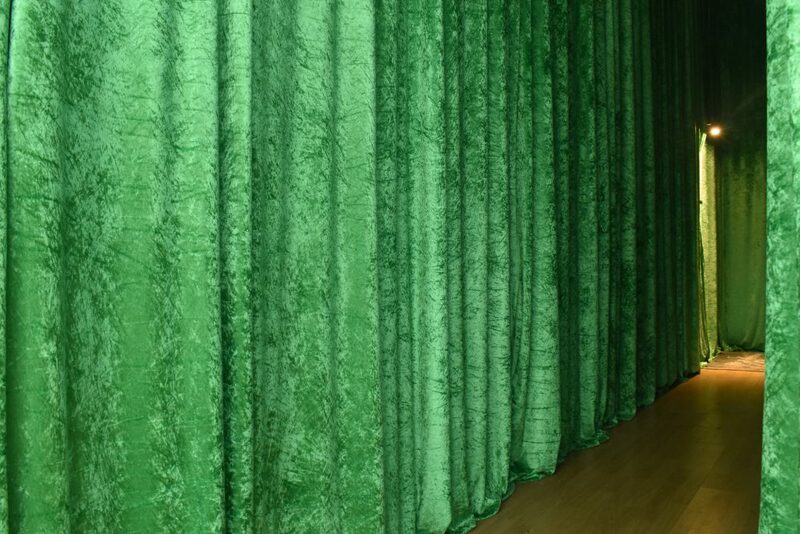 In the past, I have often used installation concepts to achieve this interaction between the work and the viewer. New Art West Midlands and AirSpace Gallery have given me great support and feedback from the show itself, which has given me the confidence to push forward in the creation of new work. Selina Oakes speaks to Staffordshire University alumna Amy-Lou Matthews about her time in residence at AirSpace Gallery as part of their Graduate Residency Scheme. 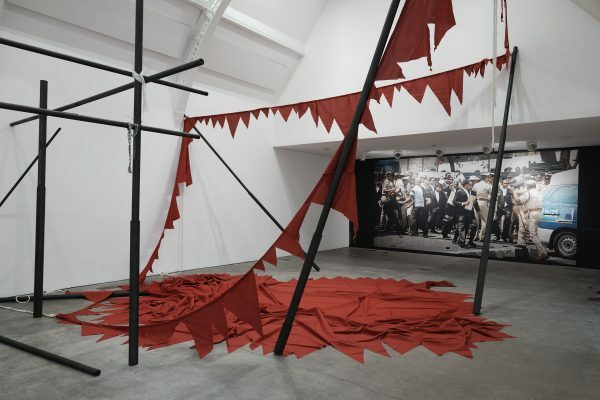 Selina Oakes reviews Ikon gallery’s current exhibition of work by Indian artist Sheela Gowda. 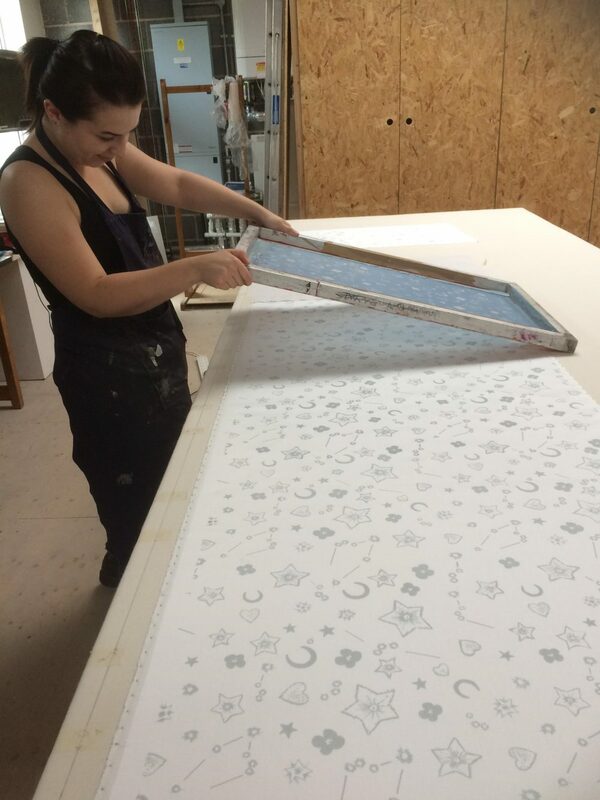 Jodie Wingham reports from Leicester Print Workshop’s Screenprinting Summer School.